I have always believed that Johnny Depp is a very talented and versatile Hollywood actor. He has proven so in most of his movies wherein he portrayed unique characters. To name a few of his movie portrayals that I admire are Edward in Edward Scissorhands, Charlie in Charlie and the Chocolate Factory, Mad Hatter in Alice and Wonderland, and Captain Jack Sparrow in the movie series Pirates of the Caribbean. The 4th installment of Pirates of the Caribbean: On Stranger Tides is now showing (May 20, 2011) here in the Philippines and in most countries. I haven't missed any of the movie series and I will definitely not miss the latest. 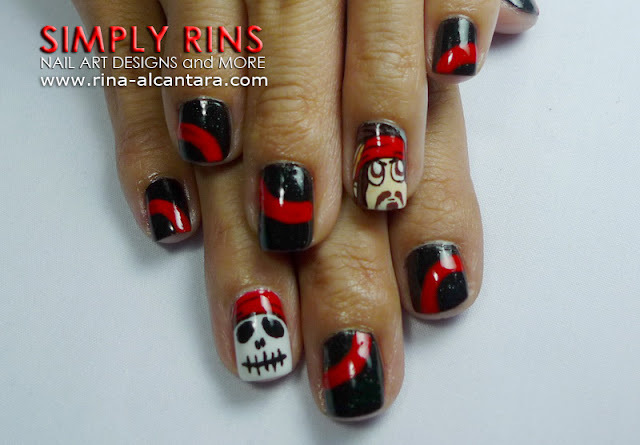 This latest nail art design was inspired by the movie, particularly by Johnny Depp's character -- Captain Jack Sparrow. I was personally challenged by this one as I was a little afraid that my drawing of the character might not look like Jack Sparrow! I used 2 coats of Orly Goth as base color except for my accents wherein I chose Essie Marshmallow. 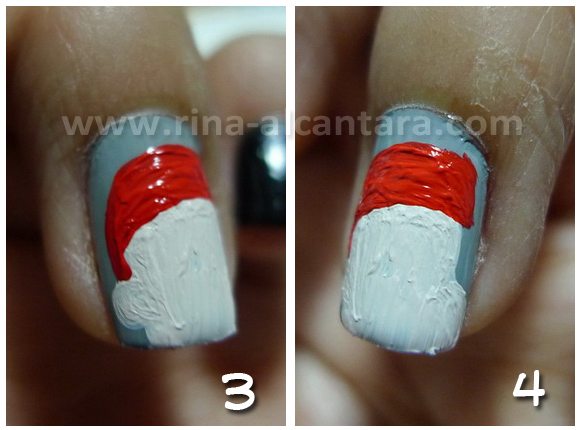 I painted everything else using acrylic paint and sealed my design using Seche Vite Dry Fast Top Coat. I made 2 accent nails (again). 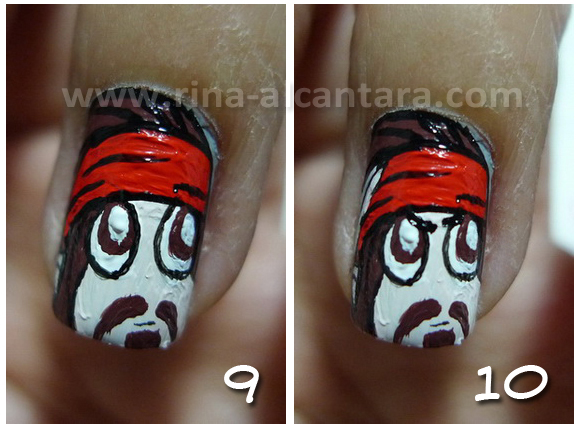 I painted Captain Jack Sparrow on my left hand and the skull logo on my right. 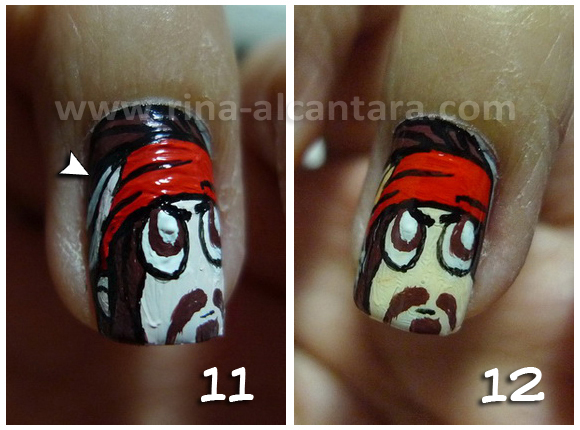 I kept in mind distinctive features of Jack Sparrow while painting his likeness on my nail. He has large eyes, mustache, dread locks, and of course, his signature red bandana wrapped around his forehead. I was satisfied with my first attempt. The following day after I created this design, I even asked my sister if she could recognize who it was. She was able to guess it correctly! Yey! 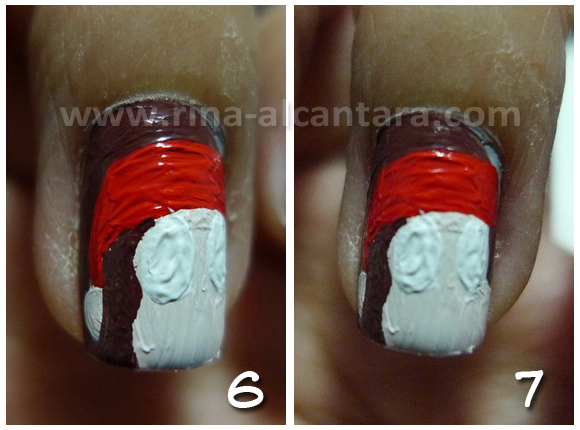 Note: I decided to show pictures in 2 angles so that you will be able to see both sides of the nail. I think this would be more helpful. The photos were shot in macro (close up) mode. In nail painting, stroke imperfections are instantly smoothened once you seal your design with a top coat as shown in the pictures of the finished nail design. The more important thing to concentrate on is reaching your preferred opacity for all the colors. I started with the shape of the face using flesh tone acrylic paint. a little to further achieve that angled look I intended. side (No.4) because I'd like to show some hair on that side. You'll see this on the next image. with pure white. I painted a few hair strands on the right side as well. I painted a smaller oval shape for the eyes and added white again after that. to separate the colors more effectively. For my right hand, I chose to paint the skull logo of the movie. I initially wanted to draw the entire skull with 2 swords crossing at the back but I figured the image would appear too small for me to paint it well. And so I decided to highlight the red bandana, that the skull also wears, and its face. When I'm working with my weaker hand, I choose to paint less complicated designs. I love how the skull complimented my Jack Sparrow design. I think the red bandana did the trick. And as for continuity on my other nails, I randomly painted red arcs. I can't wait to catch Pirates of the Caribbean: On Stranger Tides. Probably next week as my partner and I will be busy for the weekend. We'll be going out of town with some friends. 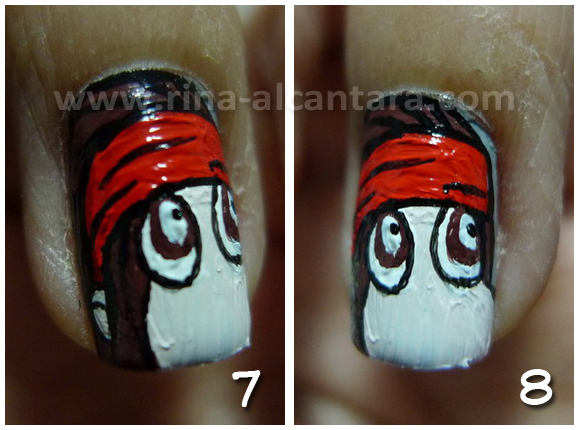 Were you able to recognize Captain Jack Sparrow on my nail? Just LOVE it! Funny, how 2stripes representing the eyebrows can make such a huge difference! Wow, that is just awsome. I am a big fan of Johnny Depp, and I absolutely love the Pirates movies! Can't wait to see On Stranger Tides! Btw, I love the tutorial! Maybe I'll try this design when I go see the movie! That could be cool! Lovely! I agree with you that he's an amazing actor! I have a lot of his movies, because I looove how he transforms the characters! And pirates are no exeption! I really love your nail arts and designs and i am always and will be promoting you every time someone asks for a nail blog. :) keep it coming.